It's been quite a couple of days for Fortnite fans. Last week, a captured scene from a match of Battle Royale went viral, showing streamer Muselk attempting to rescue someone trapped on the side of the island, before accidentally killing them with a ATK buggy in true tragi-comic fashion. It become so popular, in fact, that Epic Games itself acknowledged the failed rescue attempt by posting the video in all its glory on the Fortnite Twitter account, where you can watch it for yourself below. Then, in this week's update to Battle Royale, a gravestone commemorating the event was discovered at the exact location where the manslaughter took place, and the victim himself - Chappadoodle, as he's known in the game - shared his side of the story online in a Reddit post. 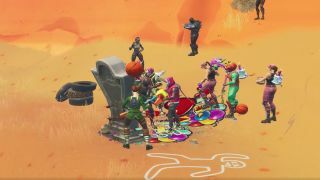 Now, Fortnite fans around the world are attempting to hold funerals for Chappadoodle, meeting at the gravestone - straight from the battle bus - and momentarily putting away their weapons and pickaxes to pay respects to a fallen comrade. Sadly, not everyone has been playing nicely, and some are using these in-game gatherings as opportunities to rack up kills and generally cause more mayhem during a time that's supposed to be held sacred. Tut tut. This particular misanthrope, for example, managed to acquire 12 kills with some well placed explosives (before being quickly taken out himself), while another hapless player actually destroyed the gravestone itself, naturally enraging the nearby attendees and stirring up an indue skirmish. There have been some successful ceremonies, and I'm sure plenty of civil interactions have taken place unrecorded, but what do you expect? This is Battle Royale, and players are going to do whatever it takes to get a win, even if it means causing more death at a funeral. Fortnite fatigue is real, so find out the cure with our guide to the best games like Fortnite and best games like PUBG.